【NEWEST AIR-POWER TECHNOLOGY】The newest Air-power technology with QI standards allows you to charge 2 phones intelligently and efficiently at the same time, makes the wireless charging experience much better! 【QUAD COILS OF SENSING AREA】Built in quad coils provide you a wider charging area and free alignment on QI charger for your phone (iPhone X, iPhone 8, iPhone 8 Plus, S8/ Note 8/ S8 Plus, etc.) to charge one phone at any position! 【5W WIRELESS CHARGING & 10W Quick Charge Mode* 2 DEVICES】5W model *Using 5V,1.0A adapter is for Any Qi-enabled devices like iPhone X/8/8 plus Samsung Galaxy S9/S9 Plus and other Qi-enabled phones; 10W fast charging model *Using QC2.0/QC3.0 adapter(9V,1.1A) is ONLY for Samsung Galaxy S8/ S8plus/S7/S7 edge/S6 edge plus/Note 5 series devices so far. Please use the most appropriate adapters for best results. 【ADVANCED SAFETY FEATURES】Featuring over charging, over-voltage, over temperature and over-current protection, never overcharge your battery or waste energy. The anti-slip rubber pads design will prevent your phone and the charger from slipping off any surface. 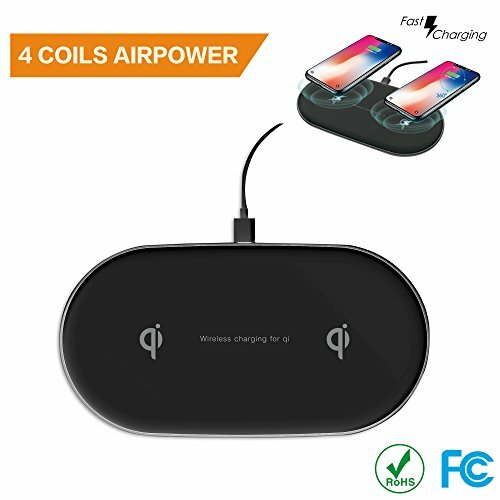 【PACKAGE & WARRANTY】You will get 1 x 4 coils Qi Wireless Charger Pad, 1 x 3.3ft USB C Cable, 1 x User Manner, 1 x Retail Package. Hassle free 12 months money back/replacement warranty with 24-hour response service is friendly offered.